I wish you a sunny Monday morning and a good start into a beautiful and short week thanks to a holiday on Wednesday which brings us an extra long weekend. What the “Rat Pack”, Frank Sinatra, Dean “DINO” Martin and Sammy Davis Junior and later Robby Williams were in the entertainment industry during the last century, that’ s Justin Timberlake in 21st century. His 2018 tour “Man Of The Woods” brings himself, his music and his fashion style today, August 13th to Berlin – Germany, August 16th to Zurich – Switzerland and finally on Saturday, August 18th to the City Hall of Vienna, the home of FashionTV’ s head office. What can we expect here in Vienna concerning his legendary style? Justin Timberlake showed off his impeccable style yet again with navy double-breasted blazer. Justin Timberlake Chinos Justin Timberlake chose a pair of classic tan chinos for his look at the ‘Inside Llewyn David’ photo call. Let’s make a short break of the fashion show and let’s be entertained by Justin’ s song “Say Something” from his new album, 244 Million video views on YouTube. Justin Timberlak stayed true to his favorite designer, Tom Ford, at the Time 100 Gala where he wore this checkered tuxedo. Jessica Biel matched her hubby with this column-style black dress. Also Justin' s song "Filthy" has already 65 Million video views on YouTube. And here’ s “Supplies” with 27 Million video views on YouTubr. Don’t miss to secure zou’re ticket to see Hustin’s brand new Zip-Jacket. 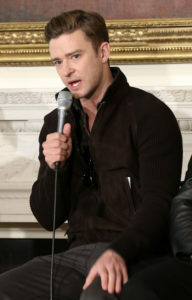 Justin Timberlake chose a brown zip-up jacket with ribbed sleeves for his look at the Student Music Workshop in Washington D.C. The bonus track of today is my personal favorite video of Justin, 277 Million video views on YouTube. I wish you a fantastic new week and come back soon with the next story.